This booklet, formely known as the Applications Guide, provides a self-guided introduction to the CableEye® Cable Tester and Harness Tester. Use it to learn how the software works. In general, we devote one page to each major function. For greater depth, please refer to the CableEye User’s Manual. This booklet also serves as an excellent training tool for new employees, or as a preview of capabilities that you may not have used previously. 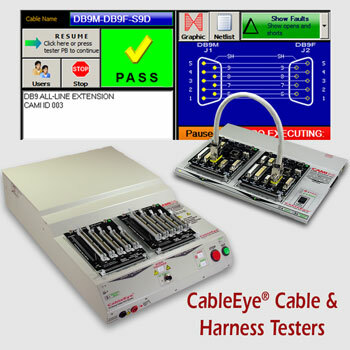 To gain the greatest benefit, have the CableEye tester, a set of connector boards, and a test cable available to you while you are reading so you can immediately try the operations we discuss. For convenience, we recommend the CB-T1 training board. Low Voltage: M3U, M3UH For all of the above plus resistance (contact, isolation, embedded), and diodes (orientation, forward voltage, reverse breakdown). Low Voltage and High Voltage: HVX, HVX-21 For all of the above plus HiPot (dielectric withstand voltage and insulation resistance).